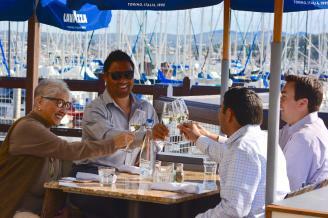 Monterey Bay Food Tours is the first and only walking food tour in Monterey. It is a great way to visit multiple unique local eateries to sample specialties at a leisurely pace, with the experience of local coordination by a local tour guide. On-line booking is available and will accommodate up to 12 people. We also offer custom and private tours for those looking to individualize a tour such as all seafood, beer only, 3 restaurants with larger portions, etc. Our standard tours are approximately three hours and we will visit 4-6 different restaurants and eateries, spending anywhere from 15-30 minutes at each stop Our customers have a unique experience that they would not have if they were to visit these stops on their own. This could be sitting somewhere special, visiting the kitchen, talking with the owner/chef/manager, eating something that is not on the menu or some other unique experience. We also stop at some historic locations and talk about history and other fun facts about Monterey as we walk between restaurants.